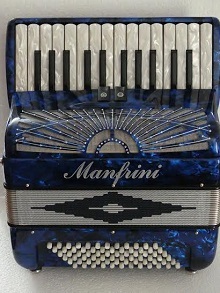 SPECIAL DEALS ON MANFRINI ACCORDIONS. Genuine stock clearance - stock items only. Next day/2 day delivery dependant on location. 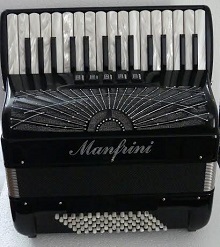 Manfrini Accordions are a top quality instrument made in Italy and manufactured specifically for Manfrini in Scotland along with top quality Italian reeds. The Ochil range of instruments have Tipo A Mano (hand made type) reeds, fitted in Italy. The Artisan and Esperto instruments have A Mano (Hand made) reeds which are made in Italy then tuned and set up by Robert Rolston, and fitted and valved by Patrick Jackman of Manfrini in Scotland. We normally keep stock of instruments in the Artisan range but the Esperto models are made to order to suit the customers requirements. 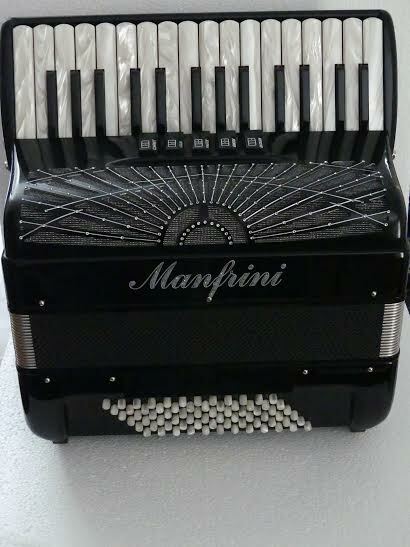 The Manfrini accordions are gaining in popularity as customers appreciate the sheer quality and playability of the instruments, and they are the preferred instrument of professional musicians such as Phil Cunningham,Donald Shaw, and The Mark Knoffler Band. Acorn Instruments are the approved retailer for Manfrini in England. 26 treble keys with 72 bass, 2 voice treble (8/8) with 2 couples. 3 voice bass. Tipo a Mano (hand made type) reeds. A Professional instrument for the mobile musician. 30 key, 3 voice (16/8/8) treble with 5 couplers and 72 bass, 4 voices. A mano (hand made) reeds. This instrument is the same spec as the Artisan 34/4/96 however the reeds are A Mano Bombata as fitted in our exclusive Esperto range. This is a very special instrument for the discerning player who wants a compact model and does not want cassotto.